After a flight do you ever feel like there’s more turbulence in your gut than there was on the plane? If you experience digestive issues after flying, you’re not alone! About half of America has experienced brief to mild instances of constipation after flying. So, what gives? And how can we start off our vacations on the right foot? As it turns out, the stress of getting to the airport on time is not the only culprit for digestive distress after flying. There are several factors at play, the first of which may be a change in schedule. Our guts like routine and become familiar with how much water we drink a day, what time we eat breakfast, how much daily movement we allow ourselves, et cetera. On that first day of travel, chances are you’ve already altered your routine. Perhaps you’ve woken up at the crack of dawn, jumped in a cab, and rushed to the airport. Before your flight, you eat a prepackaged meal and decide to splurge on a Starbucks latte (while skipping the 12 oz glass of water and walk with your dog that you typically have in the morning). Already, you’ve made seemingly small changes that may result in changes in digestion. Another factor at play when flying is dehydration. The air in an airplane is much drier than we are accustomed to, extracting liquid from our bodies without us knowing! Our guts react to dehydration by soaking up water from the foods we are digesting, ultimately causing dry, hard to pass stool. Finally, there’s the air pressure we experience while flying. While cabins in airplanes may be pressurized for our safety, we still experience high altitude air pressure. High altitudes while flying or high up in the mountains is proven to affect our digestive systems. At these altitudes, our bodies essentially shut down non-essential functions, like digestion, so that they can take care of our essential functions, like breathing. Yikes – that’s a lot! What can we do to get ahead of these issues and beat the bloat? Drink more fluids. We recommend drinking half your body weight in ounces of water every day, but especially on travel days. Money saving tip: take an empty water bottle with you to the airport and fill it up before getting on your flight. If you’re feeling environmentally friendly, you can even ask the flight attendant to fill your bottle instead of wasting a plastic cup. Don’t be afraid to use the bathroom many times during your flight. If you tend to worry about asking your seat neighbor to move, book an aisle seat! Take a good probiotic. Give your gut some extra help by introducing a probiotic to your supplement routine. Feel free to reach out for suggestions on our recommended brands! Try intermittent fasting before or during your flight. Many flight attendants swear by this trick to keep their digestion running smoothly and to even beat jetlag! We have heard first hand in the office that eating 2-3 hours before take off and waiting until you land for your next meal can do a lot of good. While on your flight, give your stomach a break by sticking to herbal tea, water, or black coffee. Enders, Giula (2018), Gut: The Inside Story of Our Body’s Most underrated Organ. Vavricka, S, et al (2014). 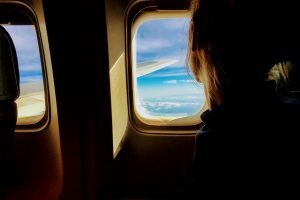 High altitude journeys and flights are associated with an increased risk of flares in inflammatory bowel disease patients. Accessed via https://academic.oup.com/ecco-jcc/article/8/3/191/527967. Grant, S. Flying Considerations: Effects of Air Cabin Pressure on Digestion. « UTI: Are there alternatives to antibiotics?